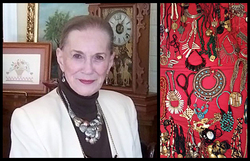 The sale of jewelry in the collection of the late Nancy Delaney (left) will benefit two scholarships at SFA. NACOGDOCHES, Texas - The estate of the late Nancy Delaney will fund two endowed scholarships for deserving students within Stephen F. Austin State University's School of Art and College of Fine Arts. The scholarships will be funded in part through proceeds from a jewelry sale planned for 10 a.m. to 5 p.m. Saturday, Dec. 8, at The Cole Art Center @ The Old Opera House in downtown Nacogdoches. An artist and musician, Delaney, whose husband, Creighton, was chairman of SFA's art department in the 1960s, amassed an extensive jewelry collection during a lifetime of worldwide travel. It was her desire, as stipulated in her will, that her estate establish the Creighton H. Delaney Endowed Scholarship for a financially needy student in the Department of Art and the John N. Staley and Margaret Anderson Staley Endowed Scholarship for a financially needy female student in the College of Fine Arts. Her estate, along with proceeds from the sale of her jewelry, will fund the scholarships. The Staleys were Nancy Delaney's parents. The sale will accept only cash or check. SFA's historic art gallery, Cole Art Center is located at 329 E. Main St. Exhibitions showing through the end of this year include SFA's Biennial Juried Art Metals and Jewelry exhibition, "Kymia Nawabi: Not For Long, My Forlorn" and a vintage Christmas decoration, ornament and toy display.